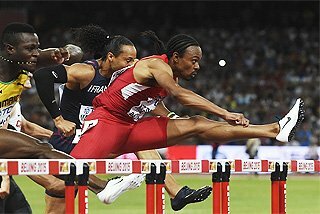 The Ethiopian Athletics Federation (EAF) have confirmed a final squad of twenty-seven athletes for Athens Olympics. 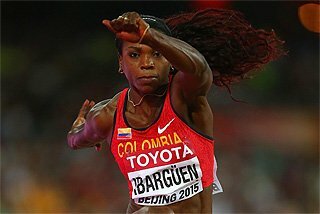 The highlight of the selections sees two-time Olympic and one-time World 10,000m champion Derartu Tulu make a record-equalling fourth appearance in the history of the Games, an Ethiopian achievement that she will share with 1968 Mexico Olympics Marathon Gold medallist Mamo Wolde. Tulu, the Sydney Olympic champion who had been omitted from a list of 25 Athletes issued by the Federation three weeks earlier, now has a fighting chance to become the first African to win three Olympic Gold medals. She has been given a starting role in the 10,000m team alongside World 10,000m champion Berhane Adere and silver medallist Werknesh Kidane, with Ejigayehou Dibaba dropping as a reserve. 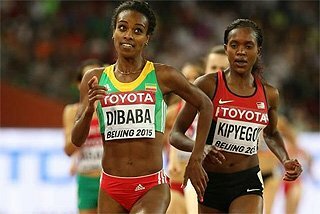 An Olympic place had looked to be well beyond the former World 10,000m champion, despite a late run that saw her record a reasonable time of 30:51.07 for the distance on July 10 in Barakaldo, Spain, because E. Dibaba has a better time of 30:43.01 for the 10,000m. Tulu got the nod ahead of her 22-year old cousin because according to Endalk Kelemwork, Technical Director of the Ethiopian Athletics Federation (EAF), "we felt that Ejiageyhou =(Dibaba) will provide a better medal hope in the 5000m." The 10,000m final in Athens will be the last track race for Tulu as she moves to a career as a full-time Marathon runner. Tulu's inclusion also means that Ethiopia will go with the same squad in the women's 10,000m as in the 9th IAAF World Championships in Paris last year. Even though Tulu was forced to withdraw from the race early on due to stomach problems, Adere and Kidane occupied the first two places on the medals podium. while E.Dibaba finished ninth in Paris. 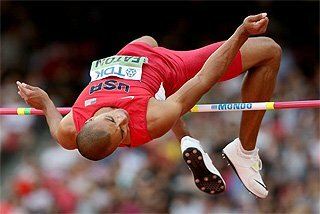 "It is being talked in the media that nothing whatsoever can deny our athletes the top three places in the medals podium," Kelemwork said. 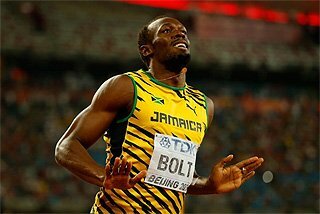 "But we know that there are some runners to watch out for, most notably Chinese athletes." 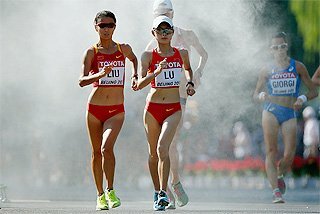 In Paris last year, Chinese runner Sun Yingjie hastened the pace early on giving Adere and Kidane the incentive to record the third and fourth fastest times ever for the distance. But with World Marathon record holder Paula Radcliffe (GBR) still also in the running for the 10,000m in Athens, Kelemwork believes that there is every incentive to get the race tactics spot on. "Everyone knows our athletes and there are no secrets anymore. But we must get the tactics correct in Athens." With Tulu now certain to start in the 10,000m, E. Dibaba moves down to the 5000m where she will line up alongside her sister and world champion Tirunesh Dibaba. And the duo are determined to grab their share of the medals. "It would be great to have both of us on the medal podium in Athens," Tirunesh said. "I am sure it will be a unique achievement." 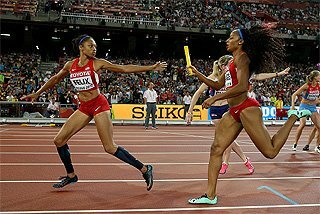 The duo are also embarking on a duel with Ethiopian-born Turkish athlete Elvan Abeylegesse, the favourite for gold in the distance after beating the sisters on the way to a World record in Bergen, Norway in June. "We are ready for her and everyone else," said Tirunesh. And the sisters have the backing of the EAF' technical staff to halt Abeylegesse's run to Gold. "They are the second and fourth fastest Athletes at the distance," said Kelemwork of the sisters. "If someone should stop her, then it will be either or even both of them." Team tactics will be important in such a race and Dr. Woldemeskel Kostre, coach of the Ethiopian 5000 and 10,000m teams, says that the duo and Sentayehu Ejigu, the other runner in the Ethiopian 5000m squad will be prepared for anything that comes their way. "If I tell you what we have planned, then it will not a secret, would it?" he said. "Anyway, our girls will be prepared for Elvan (Abeylegesse) or anyone else who challenges them." World 5000 and 10,000m record holder Kenenisa Bekele has been picked to run in the 5000 and the 10,000m races. Bekele, who stated two weeks ago that he will double in the Greek capital, has again reaffirmed his decision to run both races. "After discussions with the Federation, we have decided that I will run both the 5000 and 10,000m races in Athens," Bekele said. "It will be difficult, but I believe that I am capable of doing it." His statement is backed by Dube Julo, EAF Executive Committee member, who says Bekele's double is a "certainty". "The Technical and Executive Committees of the Federation have agreed that Kenenisa (Bekele) will run in both races in Athens," he said. "We have told him about this and he has agreed to our decision. This is unless he encounters any major health problems." As well Bekele, both Sileshi Sihine and Gebregziabher Gebremariam (reserve) have been picked for both distances. 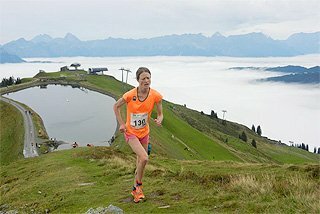 Five athletes in total have been listed for the two distances, and with Haile Gebrselassie only going at 10,000 - where he seeks an unprecedented third Olympic 10,000m gold medal - and Dejene Berhanu only selected for the 5000, this means that at least one runner will run in both disciplines. 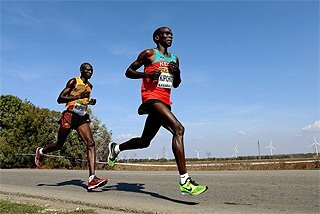 While the Federation remains confident of the country's chances in the 5000 and 10,000m races, Kelemwork believes that the Marathon team faces a huge challenge from some of the world’s leading runners. 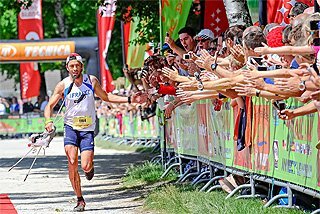 "In the men's team, we have Gezhagne [Abera] who has the leading time of 2:07:56," he explains. "We have to do battle with runners who have run 2:04.55 (Paul Tergat's Marathon World Record) and it is going to be difficult." But Dr.Yilma Berta, coach of the Marathon team, believes that there is a reason for optimism in Athens particularly in the form of Abera's wife Elfnesh Alemu, who he believes is an Athlete to watch. "I can say that Elfnesh [Alemu] is one of the most feared women Marathon runners and I am not exaggerating," he said. "The way she ran against Catherine Ndereba in Boston was tremendous and on her day, she can beat anyone." 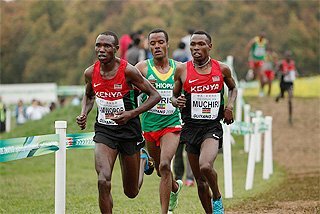 Abera's injury "not a problem"
In the men's Marathon, Ethiopia will be going with the same athletes who failed to leave up to their billing in Paris last year (Gezhagne Abera and Hailu Nigussie both dropped out early on), but Dr. Berta does not see that as a major concern. "These things happen in the Marathon," he said. "You put so much in preparing for the big race and injuries are very common, but this does not mean that these things will happen every time." Ethiopia's hopes are pinned solely on Abera, who has struggled to repeat the form that saw him win back-to-back Olympic and world titles in 2000 and 2001. His hopes of a comeback after eight months out of action were hampered after he again dropped out after 10kms of the Flora London Marathon in April, after aggravating an Achilles heel injury. Since then, Abera has made a successful return to training where he won a 40km race in Addis Ababa, and according to team Doctor Ayalew Tilahun, he is now back to fitness and ready to make up for lost time. "After he returned from London, we sat down and made his health our top priority," Dr. Tilahun explains. "We sent him to Germany for treatment and we have received certification of his clean bill of health. The coaches have then increased his work load in training and now he is up to full capacity to handle full training sessions." In the middle distances, Ethiopia's hopes for a medal in Athens will again be on women’s World Indoor 1500m champion Kutre Dulecha, but her preparations have been hampered by a combination of ailments and an Achilles tendon injury. 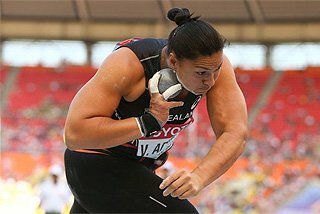 Dulecha came fourth in Sydney four years ago but her hopes this time around will largely depend on how well and fast she can recover from the injury. Ethiopia will also be taking two debutants for the women's distance. Eighteen year old Mestawot Tadesse has enjoyed a tremendous year winning a junior silver medal at the 2004 World Cross Country Championships, and at 17 years of age, Meskerem Legesse is the youngest member of the squad and a prospect for the future. In the men's 800m, the country's leading runner Berhanu Alemu is Ethiopia's sole representative. With no clear favourite for the distance in Athens, he will fancy his chances to at least qualify for the final after closely missing out on the chance a year ago in the World Championships in Paris. Ethiopia's middle distance hopes have been given a huge boost in recent weeks with the news that Ethiopian Junior cross champion Mulugeta Wondimu had obtained the 'A qualification mark for the 1500m after winning the "B" race in the DN Galan IAAF Grand Prix race in Stockholm, in an impressive time of 3:32.38. Wondimu's performance in Stockholm was the first of two impressive runs in six days that saw him smash the four-year old Ethiopian Junior and senior records for the distance. He also put up a good fight with Morocco's Hicham El Guerrouj in the KBC Night of Athletics in Heusden, Belgium finishing second in 3:31.13 in only his fourth ever 1500m outside Ethiopia. NB- All Athletes in brackets are reserves.